Statistical learning is a set of techniques for building a model which attempts to predict a response variable from one or more predictor variables. Labeled data are tuples of predictor values with their associated response values. Typically one divides the labeled data into a training set and a test set. The model is built using the training set and then the test set is used to evaluate the performance of the model. The test set guards against overfitting, which is when a model performs well on the data used to train it, but poorly on unseen data. Variables can be quantitative or categorical. When a variable is categorical, it can take one of k of unordered values. We can convert a categorical variable to k-1 dummy variables. At most one of the dummy variables can be set to 1 and all of the categorical variables are 0 when the categorical variable has the baseline value. When the response variable is quantitative, a model which predicts it is said to be a regression model. When the response variable is categorical, the model is a classification model. R has a data type called data frame which equivalent to a relational database table. scikit-learn uses numpy, which is a Python library which provides a homogeneous multidimensional type called ndarray. The idea is to find the k nearest neighbors in the labeled data to an unlabeled tuple and use them to make the prediction. If the response is numeric, average the neighbors. If the response is categorical, use majority rule. 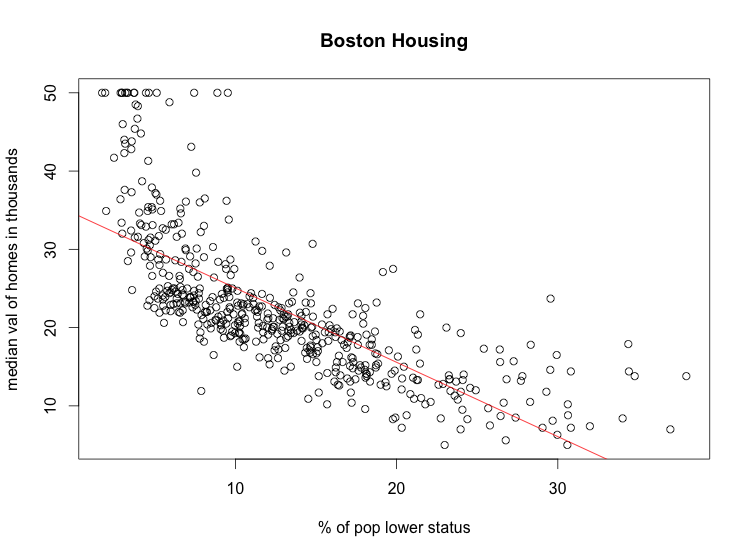 Nearest neighbors works best when there is lots of input data and four or fewer predictors. The reason that lots of predictors don't work well is because in high dimensions, the k nearest neighbors are often quite far away. 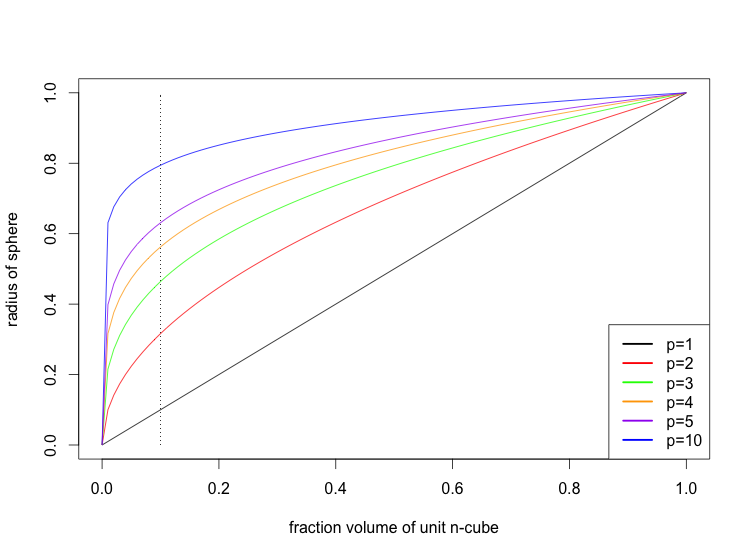 Here is a graph showing the radius of the p-sphere needed to include a given fraction of the predictors, assuming that they are uniformly distributed in the unit p-cube. The dotted line marks the radius of the p-spheres which include 10% of the predictors. The situation is actually somewhat worse than depicted because in high dimensions the p-sphere must often extend outside of the p-cube. 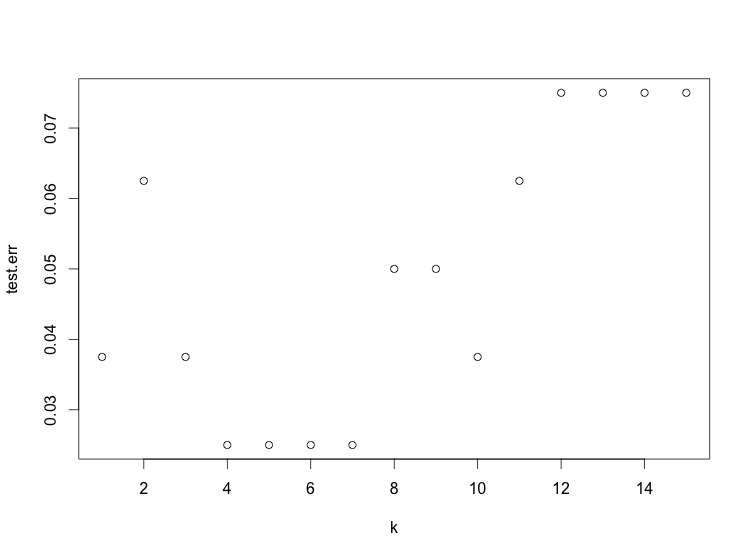 The plot shows 4 ≤ k ≤ 7 works best. We note that if the test data is used to choose a parameter, then it cannot be used to estimate the accuracy of the final model. Hence, when training a model with a tunable parameter, we may split the data into three sets: training, validation, and test. The validation set is used to choose the parameter. There a few ways to implement nearest neighbors. The brute force method checks every point in the training set to find the nearest neighbors. One must keep a list of the k nearest neighbors found so far. This is a O(nk) algorithm, or O(n log k) if a priority queue is used for the list of k nearest neighbors. K-d trees and ball trees are data structures which can be used to index the location of the points in the training set. Whether they improve performance depends on the data; they are generally ineffective in high dimensions. Linear regressions builds a model which is linear in the predictor variables. Usually the data overdetermines the model. The customary way to deal with this is to select the model which minimizes the sum of the squares of the residuals, which are the differences between the predicted and actual response values. This is called a least squares fit. 1  ( 1 )  " "  " " " "   " "  " " " " " " " " " " " " " "     " "   "*"
2  ( 1 )  " "  " " " "   " "  " " "*" " " " " " " " " " "     " "   "*"
3  ( 1 )  " "  " " " "   " "  " " "*" " " " " " " " " "*"     " "   "*"
4  ( 1 )  " "  " " " "   " "  " " "*" " " "*" " " " " "*"     " "   "*"
5  ( 1 )  " "  " " " "   " "  "*" "*" " " "*" " " " " "*"     " "   "*"
6  ( 1 )  " "  " " " "   "*"  "*" "*" " " "*" " " " " "*"     " "   "*"
7  ( 1 )  " "  " " " "   "*"  "*" "*" " " "*" " " " " "*"     "*"   "*"
8  ( 1 )  " "  "*" " "   "*"  "*" "*" " " "*" " " " " "*"     "*"   "*"
9  ( 1 )  "*"  "*" " "   "*"  "*" "*" " " "*" " " " " "*"     "*"   "*"
10  ( 1 ) "*"  "*" " "   "*"  "*" "*" " " "*" "*" " " "*"     "*"   "*"
11  ( 1 ) "*"  "*" " "   "*"  "*" "*" " " "*" "*" "*" "*"     "*"   "*"
12  ( 1 ) "*"  "*" "*"   "*"  "*" "*" " " "*" "*" "*" "*"     "*"   "*"
13  ( 1 ) "*"  "*" "*"   "*"  "*" "*" "*" "*" "*" "*" "*"     "*"   "*"
Naive Bayes is a popular text in text classification, in which case C means that a document is in class C and Xᵢ means that a document has feature i. Given a corpus of training data, we count the total number of documents, the total number of documents in class C, the total number of documents with feature i, and the total number of documents in class C with feature i. This allows us to estimate the probabilities on the right hand side of the equation above. A decision tree is a binary tree which is used like a flow chart to come to a decision. At each node, one of the predictor variables is examined, and one proceeds to the left or right child based on the outcome. 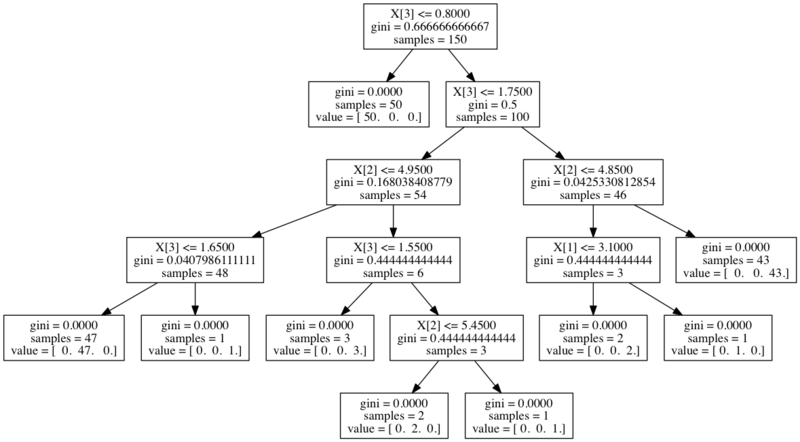 Finding an optimal decision tree is NP-complete. Hence a greedy algorithm is usually used. Decision trees tend to overfit. Random forests use two techniques to overcome the problem. First, they use bagging, in which samples with replacement are taken repeatedly from the training data, and for each sample a decision tree is built. The final classifier takes the average of all the trees. If the response variable is categorical, the majority rule can be used. Second, at each node of the tree, a random subset of the features is chosen as candidates for the predictor variable to be examined at that node. This is done to reduce the correlation between the trees. 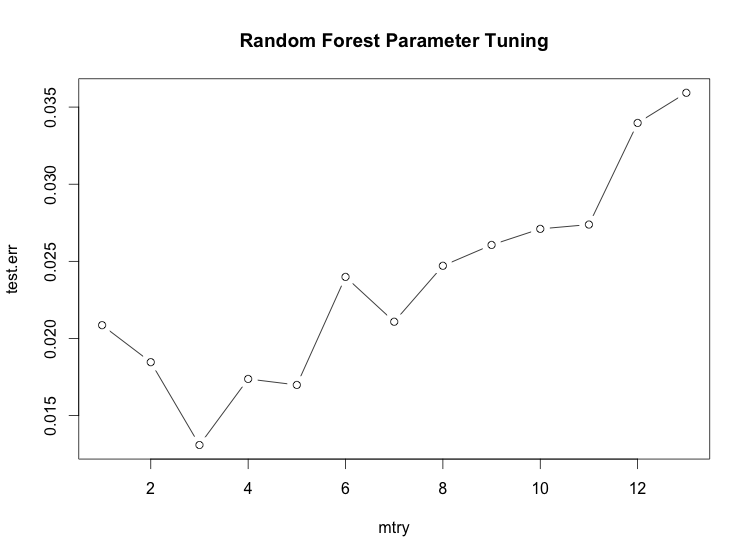 The Random Forest technique has potentially quite a few parameters, but the only one that requires tuning in practice is the number of features randomly selected at each node. If there are n features, then sqrt(n) is often a good value. The number of trees usually doesn't have to be tuned because increasing the number of trees never results in overfitting. The test error can be used to select the best of several models, or to select a value for model with a tune-able parameter. One technique is to split the data into two parts: training set and a validation set. Using 70% for training and 30% for validation is a popular choice. For each model, train on the training set and use the validation set to compute the test error. Cross validation can be used to reduce the variance of the test error at the expense of training more models. The technique is to split the data into k equally sized parts. Train each model k on k - 1 of the parts, holding a different part out for computing the test error each time. The final mean-squared error is the average of the k values. k is often 5 or 10.